Probably the result of a cross between A. plantaginea and A. maritima, 'Bloodstone' has bright red flowers and is a slightly larger selection than our commonly available A. maritima selections. The flowers are probably the most ornamental aspect of this plant, lasting months at a time and drawing butterflies in droves. But the foliage is also ornamental -- grass-like and evergreen, it forms dark green tufts that last year-round. 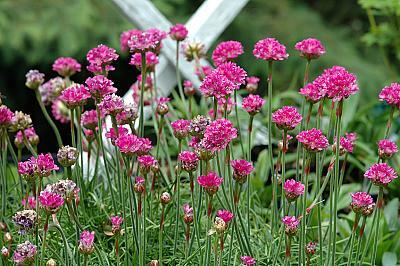 I like to use this as a single accent plant in flower beds, but it also works quite well in groups or along the border. Since it holds its shape so well it can also be used to create geometric designs in the garden. Make sure that it gets a fair amount of light and drains well or the crowns will start to rot. It's an extremely drought tolerant plant, so plant it in dry places where its lush color will be appreciated.